"Integral caught a unique moment in the birth of a rare binary system," says Enrico Bozzo from University of Geneva and lead author of the paper that describes the discovery. "The red giant released a sufficiently dense slow wind to feed its neutron star companion, giving rise to high-energy emission from the dead stellar core for the first time." The pairing is certainly peculiar. ESA's XMM-Newton and NASA's NuSTAR space telescopes showed that the neutron star spins almost every two hours – very slow compared with other neutron stars, which can spin up to many times per second. Then, the first measurement of the magnetic field of such a neutron star revealed it to be surprisingly strong. "These objects are puzzling," says Enrico. "It might be that either the neutron star magnetic field does not decay substantially with time after all, or the neutron star actually formed later in the history of the binary system. That would mean it collapsed from a white dwarf into a neutron star as a result of feeding off the red giant over a long time, rather than becoming a neutron star as a result of a more traditional supernova explosion of a short-lived massive star." "We haven't seen this object before in the past 15 years of our observations with Integral, so we believe we saw the X-rays turning on for the first time," says Erik Kuulkers, ESA's Integral project scientist. "We'll continue to watch how it behaves in case it is just a long 'burp' of winds, but so far we haven't seen any significant changes." The rapid response of the follow-up observations was enabled by the SmartNet community. This included important contributions from ESA's XMM-Newton and NASA's NuSTARand Swift space telescopes, and the ground-based Southern Astrophysical Research Telescope, Faulkes Telescopes North and South and the Las Cumbres Observatory. 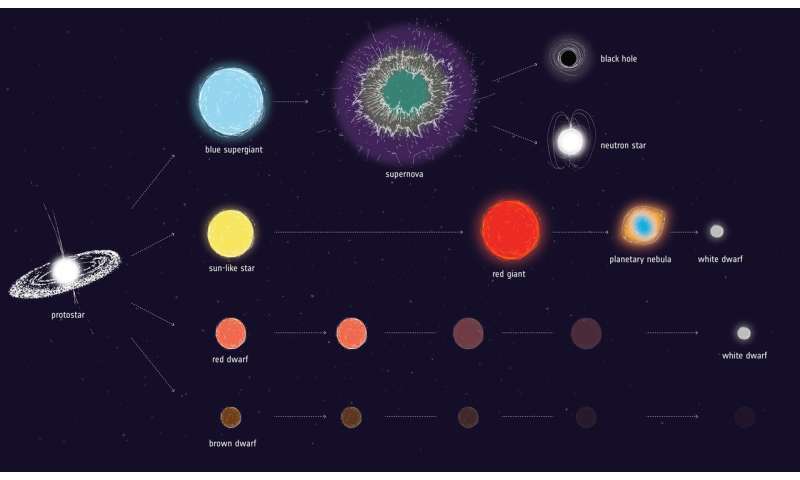 One day astronomers will realize how utterly stupid it is make an analogy between the end of stellar fusion and death. It simply makes no sense. Living things for example rapidly decay and wither away upon death, and are quickly reduced to their basic ingredients. As soon as nature has leached all the easy to get recyclables from a dead something, what remains quickly ceases to have any significant impact on their surroundings. The loss of coherency is total. What little impact remains have are not in harmony. When you compare that to the potential and actual profound effect and the dramatic interactions of white dwarfs and neutron stars to their environment it becomes clear calling them dead is ridiculous. If a dead organism had any similar fate, after death the remains would remain intact interacting as a single unit with their surroundings for many times longer than they lived in ways that exceeded their abilities to do so while actually alive! Instead of death use transition.